You are here: Home / homekeeping / Are meal kit delivery services worth it? Are meal kit delivery services worth it? Spring is here and with it a new season and a new opportunity to build healthy eating routines. We all have to eat, and along with eating comes a whole slew of tasks: Finding healthy meals, looking through your pantry to figure out what you need to use up, creating a shopping list, doing the shopping, prepping the food, cooking the food, eating the food, and cleaning up afterwards. The whole thing starts over again every day. Around the time that I decided to go on my meal kit bender, my mother-in-law passed away. I have to say it was really nice to not have to worry about finding recipes or shopping. The kit arrived and we were able to cook dinner (all the instructions are laid out) and not rely on takeout. When I messed up on the delivery dates and we had extra meals my husband and I even brought a kit to my parent’s house and made them Sunday lunch. The price is about the same as going to a fast casual restaurant ($10 per person, give or take). My husband and I did price out the meals, and it is cheaper to buy the ingredients at the store, at least where we live. I have seen those cost calculations and it might be different for different types of meals, but the ones we checked were about twice the cost of what it had been if we had bought the ingredients ourselves. just want a bit of a break from meal planning, shopping, etc. Here are the ones I’ve tried, along with the coupon codes / offers that I used (note some of these are affiliate links). Family plan is two meals that serve four for $69.92 Feels fancy, different recipes than the usual. Can take a bit more time to cook (depends on the recipes, though). Wine pairings available. Stated commitment to sustainability, non-GMOs. Hello Fresh $40 off first box $9.99 per meal (so, for three meals for two the cost is $59.94) Also offers wine. Fast. Sun Basket 3 free meals $11.49 per meal Organic, coolest packaging. Most recyclable, everything is in its own color coded paper bag. Green Chef $50 off $10.49 per meal Also has recyclable packaging. Reusable plastic jars. Terra’s Kitchen $40 off; email me for code (wendy @ wholisticwoman.com) $9.99-$16 per meal The vessel concept is neat, but you still end up with a bunch of plastic boxes. It’s already prepped (chopped), but that means you need to use it faster. Smoothies, etc. are also available. Veestro Use coupon code WHOLISTIC20 expiring 8/14/17 for 20% off https://www.veestro.com $9.99 per meal and up This one is a bit different because it comes ready to heat or freeze. So if you really don’t have 30+ minutes to prep and cook, this would be a good option. They also have an extensive vegan collection and juice / weight loss options. When I was updating my popular meal planning post, I noticed that several of the meal planning services (where you get a meal plan and recipes each week) also have a relationship with Instacart (a grocery delivery service). Now, Instacart is not available in my area, but Shipt is. So if you don’t like having to decide what to eat, simply sign up for one of the meal planning services (you can see my list of favorites in this post). Alternatively you can choose your own recipes and use Plan to Eat to spit out a shopping list. Then, you can have those groceries delivered. Voila! A meal kit, delivered, at a lower cost and with more variety. Of course, it won’t have the handy laminated recipe cards, but it also doesn’t have all the extra packaging. 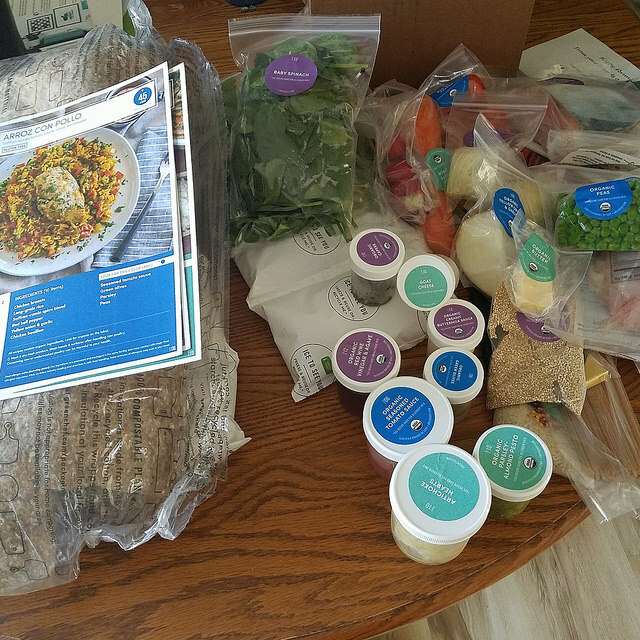 Have you tried meal kit delivery? What did you think? Let me know in the comments below! « Is having your groceries Shipt worth it?